For those of you who have not played or experienced a PRS I urge you to do so. IMHO they are one the most exciting, most comfortable, well balanced, quality guitars on the market. Their tone is like no other, unique and rich. 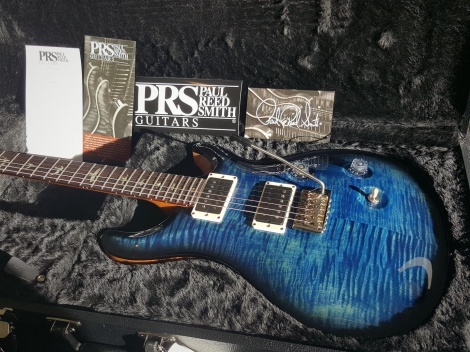 PRS 2017 CU24 Custom 24. River Blue. Custom Colour, Limited run. 3-way selector switch, Push/Pull Coil tap tone control. Not been a demo in a store, still in a box. The Custom 24 is the quintessential PRS guitar. This iconic instrument was the first model that Paul Reed Smith brought to the public at PRS Guitars' first Winter NAMM show in 1985 and has been a top seller ever since. Played by internationally touring artists, gigging musicians, and aspiring players, the Custom 24 features PRS's patented Gen III tremolo system and PRS 85/15 pickups with volume and push/pull coil tap tone control and a 3-way toggle switch. 85/15 pickups were personally designed by Paul Reed Smith to offer remarkable clarity and extended high and low end. Includes Case and all case candy.